There is no shortage of things to do in Daylesford or Hepburn Springs when visiting for a day or two. The hardest decision may be deciding where to go first. Daylesford combines a vibrant artistic community, a strong element of French provincial chic, and a produce-rich farming community. The result is an eclectic town that caters to an eclectic population of visitors. There’s something for everyone in this pretty historic town. Daylesford provides plenty of opportunities for style conscious shoppers seeking the unusual or handmade. 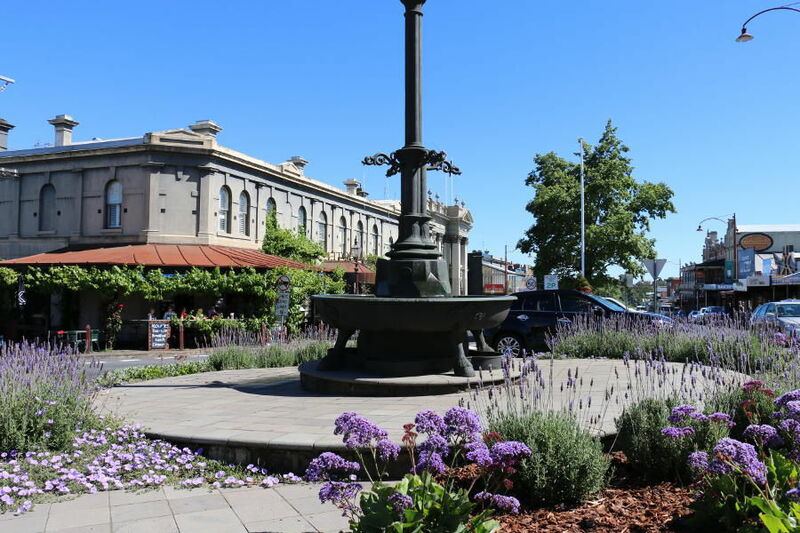 Walk down the main shopping strip in Daylesford and you’re sure to find a delightful gift of a French or European import for the home, a one off piece of clothing, rustic, handmade soap, or Japanese inspired ceramics. For those who like to support artists and locally made ‘slow fashion’, Daylesford won’t disappoint, with two boutiques located in the main street showcasing the talent of creative locals and Australian designers. Frances Pilley resides on the corner of Vincent Street in Daylesford. The store originated in Beechworth selling natural, raw and handmade products, and now has four stores across Victoria. Brimming with the beautiful scent of soaps and oils, visitors will be drawn through the shop by a tantalising selection of small ceramics, high quality leather, household and personal items, as well as quirky wall art. 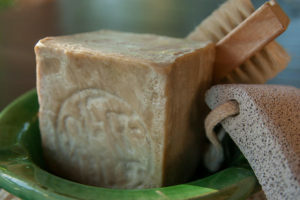 An assortment of natural, raw body products are available, made from ash, olive and laurel soap. Continuing the love affair with the natural and raw, Manteau Noir, located almost directly opposite Frances Pilley is for all lovers of french provincial chic and slow fashion. This beautiful boutique is worth visiting, just for the interior design experience. Dark walls, 19th century antiques, distressed timber and a hint of the absurd, create a delightful space to explore. Women’s wear, as well as household objects, bedlinen, cushions, home fragrance, natural body products and vintage finds, jostle for display in antique chiffoniers and on tables. 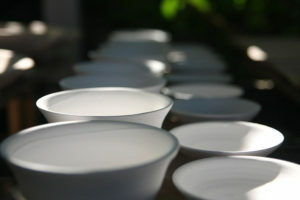 For those appreciating handmade ceramics and art, Bokeh will be a welcome surprise. 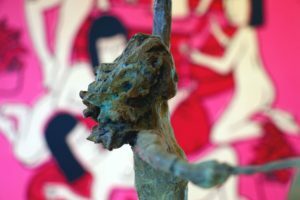 Bokeh is a retail gallery stocking work from over forty Australian artists, makers and designers. High quality ceramics, jewellery, prints, timber, as well as sculptures are on display and available for purchase. Much of the design reflects a contemporary mood with Japanese and Scandinavian influences. Bokeh should not be missed for those who love high quality handmade ceramics, and is the perfect place to find a unique gift or something special for yourself. Visit Bokeh Gallery. After exploring the European inspired boutiques of Vincent Street, shoppers can enjoy a coffee and wholesome home cooked lunch. We recommend The Larder on Vincent Street. More things to do in Daylesford and Hepburn Springs during your visit. Sample the Hepburn Springs mineral waters at Hepburn Mineral Springs Reserve. Visit the Daylesford Convent Gallery for Australian and international artists and learn about the history of this beautiful convent building. Bathe in natural spring waters and enjoy a selection of bathing experiences and body pampering at the historic Hepburn Bathhouse. Discover antiques and vintage wares at the vintage Mecca that is the Mill Market in Daylesford. Visit Daylesford’s Sunday market for fresh produce, bread, baked goods, antiques, collectables and plants. Experience a Hepburn Springs dining experience at Hepburn Springs restaurants, including the award winning restaurant, The Argus in Hepburn Springs. Visit Lavandula – an historic 1850s lavender farm with beautiful gardens, fruit orchard and herbs, and La Trattoria restaurant. For more information and reviews of places to visit and things to do in Daylesford and Hepburn Springs, follow our Facebook Page. We regularly post links to our Hepburn Springs and Daylesford news posts. Hepburn Spa Pavilions provides romantic, completely private, luxury accommodation in Hepburn Springs and Daylesford. Choose from beautiful double storey, architect designed spa villas, Saffron or Horizon overlooking the Bathhouse in Hepburn Springs. Each villa has huge double hydro spas and treetop views, with soaring timber vaulted ceilings. For more space and a home filled with antiques, Kookaburra Ridge provides the ultimate in relaxed, luxury, surrounded by two acres of European style gardens.